Egg Shop B.E.C with Tomato Jam, Black Forest Bacon, and Sharp White CheddarThe "Fish Out of Water" Sandwich with Pickled Egg and Cognac-Cured GravlaxGreen Eggs and Ham Sandwich with Double Cream Ricotta and Genovese PestoThe Spandexxx Break Bowl with Red Quinoa, Pickled Carrots, and Poached Eggs (every model’s favorite low-carb feast! )The California Breakfast Burrito and more! The concept was simple a small restaurant that served the best egg sandwiches and Bloody Marys all day but it took Egg Shop founders Sarah Schneider and Demetri Makoulis two years to launch the New York City caf with the aid of chef Korbee. That time allowed the team to define and refine their concept, a dichotomy of butter, bacon and cheesy fare counterbalanced with gluten-free, carb-free, and veg-heavy dishes. It turned out to be a winning combination, shared here by Korbee. 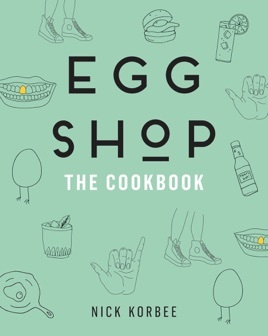 Readers will learn how to poach, baste, scramble, and boil eggs like a pro in order to incorporate them into terrific dishes such as roasted beet tzatziki salad; ham and egg sandwiches (there are 17 variations); the Spandex, a protein-packed bowl with quinoa, greens, avocado, and poached eggs; or a toothsome chorizo chili topped with half an avocado that's been quickly baked with an egg nestled inside. Can't-miss sides include Hash Baes, a literal mashup of hash browns and latkes, and chocolate milk French toast. Even if readers never get around to DIY duck confit or a cognac-cured gravlax, they're sure to find plenty of exciting new staples here.